What's In Your Writing Toolbox? Grant writing is a skill that you hone over time. And just like a good craftsman, you need a good set of tools if you want to do the job well. Maybe you have one (or many!) of the grant writing books that are on the market today. Maybe you have an APA style guide. If you're old school, you might even have Mr. Webster's or Mr. Roget's work sitting nearby. However, when it comes to proofreading and review, I'll bet you're probably using your word processor's spell check and grammar check features. And that's good. But there's more. In fact, there are a lot more writing and editing tools out there. If you're using Microsoft Word, did you know there's another tool that can help you improve your writing? There's a built-in readability score indicator that will tell you how easy it is to read what you've written. Just turn the feature on, and you'll get your scores every time you run a spell check. A higher Flesch Reading Ease score is better. And the Flesch-Kincaid Grade Level is just that - it tells you the grade level of your writing. Ideally, you want to write at a 6th or 7th grade level. No, that doesn't mean that your grant reviewer has only a middle school education. Lowering the grade level of your writing actually increases your reader's ability to process what you're saying. This newsletter is written at a 6th-7th grade level. You want your writing to be easy to read and you want it to be easy to understand. So keep your writing simple and straightforward. Want to know if your writing is clear and concise? Check out these online editing tools. Ernest Hemingway was known for his short sentences and concise language. Follow his lead, and the Hemingway Editor will reward you with a good "grade" (readability score). 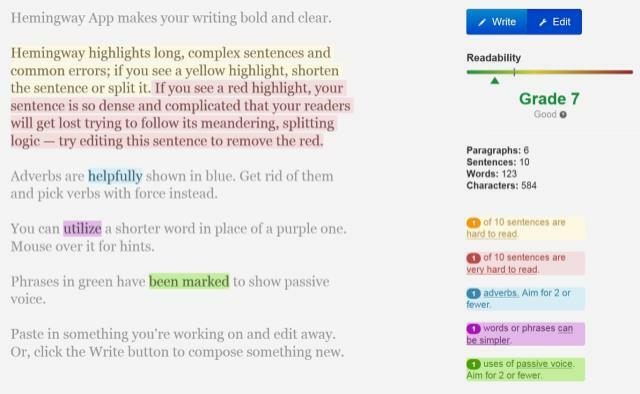 The Hemingway Editor helpfully highlights and color codes problem areas like complex sentences, complex words and passive voice. Hemingway costs $6.99 to download. After The Deadline is a free service. Like Hemingway, it will check your spelling and grammar, and it will also look for complex words and passive voice. Like its name implies, Grammarly is a grammar checker. It's a subscription service with monthly, quarterly and annual plans. Grammarly highlights the grammatical errors, tells you what's wrong and makes suggestions. It will also make vocabulary suggestions. This last tool is free, and it's a good one to use for all of your nonprofit communications. 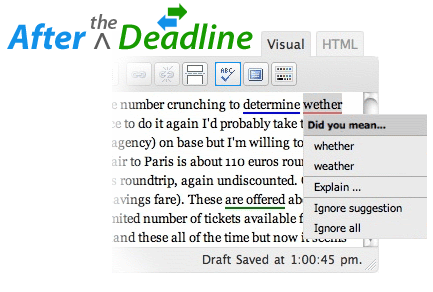 Wordifier identifies overused words in the nonprofit sector (You know the ones: help, support, give...). Simply type in a word and Wordifier will give you a red flag if you need to stop using the word or green if you're good to go. 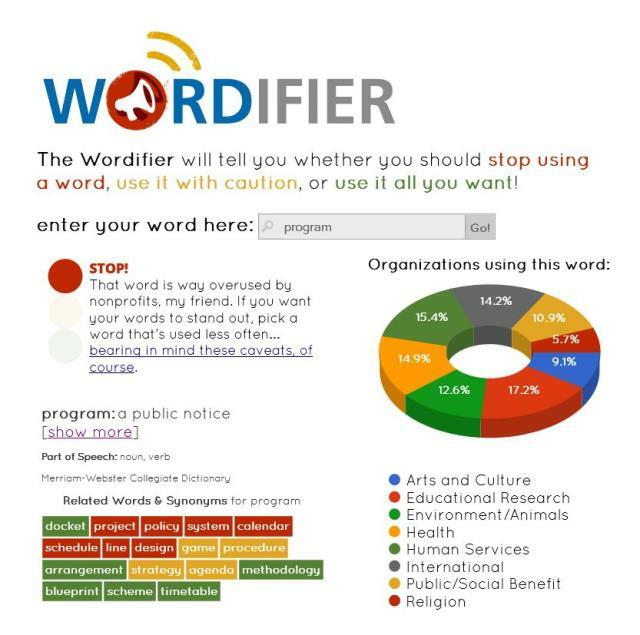 Wordifier will also tell you what types of nonprofits are overusing which words. It will also offer alternative words that cut through the clutter and will make your communications stand out. Do you use any of these online writing tools? Or maybe something else? Send me a message and let me know your favorite online writing resource. I'm always looking for good tools to add to my toolbox. NOTE: Third Sector Consulting is not an affiliate of any of these products. Here are three articles that compare some of the top online editing tools. How Did a Real Life Proofreader Perform Against 4 Online Editors? Send a message to start the conversation and learn how Third Sector Consulting can help you and your organization in 2015.